Cheekbone augmentation is one of Dr. Vendemia’s favorite procedures because of the meticulous nature of the technique, and the artistic skill required, to produce a consistently excellent result. It’s one of the easiest ways for women in the their late 20’s to early 40’s to refresh their looks without anyone suspecting that they had anything done. Dr. Nicholas Vendemia performs cheek enhancement for women and men in the New York metro area. We encourage you to contact us online or give Manhattan Aesthetic Surgery a call at 917-703-7069 to schedule a visit. Dr. Vendemia is a leading cosmetic surgeon in New York City with a reputation for custom care and beautiful results. Keep reading to find out about our top four cheekbone enhancement options. JUVEDERM® Voluma is a new injectable soft tissue filler from Allergan Medical that is designed for maximum lift, not maximum plump. Voluma’s fantastic counterparts, JUVEDERM Ultra and Ultra Plus, are both designed to add volume and plump, and not necessarily geared towards lifting the soft tissues of the mid face that stubbornly descend with age. Voluma is an excellent product for cheekbone augmentation because of the additional lift is offers, the unique look it produces that is very well suited to cheekbones, and it’s longer lasting effect that is reported to be as long as 2 years in some patients. 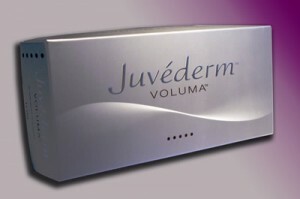 Read more about Juvederm VOLUMA by clicking here. Because HA’s are so soft, they can be molded into any shape you choose. I will often give my patients a hand mirror during the procedure to see whether or not they like the size and shape of their new cheeks, and if they want to make an adjustment, I can actually sculpt a different look. Because hyaluronic acid is found naturally in the body, HA fillers tend to absorb quickly (4-6 months). While this sounds like a bad thing to you filler veterans out there, I think it’s a good thing for the newbies. If you’ve never had fillers before, there’s always a chance that you won’t be crazy about your new look, and if this happens, the HA fillers will take the least amount of time to dissolve. The best reason to use an HA for first-timers is that they are reversible! That’s right… if you don’t like them, they can be reversed and you can go right back to your normal self in 24-48 hours. I have never actually had a patient ask for her cheeks to be put back to normal, but if it ever happens, it is possible to do as long as we used an HA. Because Radiesse is thicker than JUVEDERM or Restylane, there is a slightly higher incidence of lumps and bumps. Lumps are extremely rare as long as your plastic surgeon is experienced with cheekbone enhancement, and even when they do occur, most of them can be massaged away in a day or two. The most important thing to know about Radiesse is that it is not reversible. This is the main reason why I discourage filler-first-timers from going for Radiesse right off the bat. I totally understand that it sounds like the more attractive option since it lasts up to a year, but if you happen not to like the look of your new cheeks, you will be stuck with them for a year. If you’re a newbie, go for a “trial run” with JUVEDERM or Restylane, and then once you know you love it, switch to Radiesse the next time you have your cheeks done. With Sculptra, you won’t see your final result for at least 3-4 months. Because Sculptra is a collagen stimulator, you have to wait for your body to produce enough collagen to see a change. This gradual result is very attractive to some women who want to make sure that no one notices that they had anything done. In contrast, the results from JUVEDERM, Restylane and Radiesse can be seen immediately after the procedure. Sculptra requires a series of 3-4 injections spaced about 4 weeks apart, so it’s a much more significant time commitment than a single injection session with another filler. Because Sculptra is the most high-tech product available, and because it requires the most advanced injection technique, it’s more expensive. That being said, Sculptra is not necessarily more expensive in the long run because it lasts 4-5 times longer than JUVEDERM or Restylane, and 2-3 times longer than Radiesse. So, while the initial cost of Sculptra is more expensive, it’s quite a bit cheaper in the long term. And remember, you do get what you pay for, and the results I’ve seen with Sculptra are in a class by themselves just like the product is! Surgery and anesthesia is required to place cheek implants, whereas filler injections can easily be performed in the office without anesthesia. There is more downtime with cheek implants. While small bruises and slight swelling are possible after injectables, they are guaranteed after cheek implants. Your cheeks will be swollen, bruised, and tender for a week or so after surgery, and you will need to take at least a few days off of work. For some people, this is a minor price to pay for a permanent result, so it’s an entirely individual decision. There is a slightly higher rate of asymmetry with cheek implants as compared to fillers, and this can sometimes require another operation if the asymmetry is noticeable enough. Filler asymmetry is much easier to correct, and is much less common. At the end of the day, the most important decision is not which filler you choose, or whether you decide that you want cheek implants. The most important decision is who you choose to perform your procedure! Nonsurgical cheekbone enhancement is a very advanced injection technique, and there are not many plastic surgeons who are truly comfortable with these procedures. Make sure your surgeon does cheekbone enhancements regularly, that he or she can show you lots of before and after photos, and that he or she is committed to making you as happy as possible with your result by guaranteeing to see you in a follow up consultation and including any touch up injections in the initial cost.